Hi, I am making some enquiries about a guitar I own, I'll give you the information about it I have, perhaps you could furnish me with more. I bought it approx 10 or 15 yrs ago from Trevor Mee, formally of the 60's band Unicorn and later the backing band of Billy J Kramer. He said at the time it was one of 25 Thunder 111's that were factory customised to a 12 string. Unfortunately at some point during Trevor's ownership it had the neck broken, which was professionally repaired so the serial number was painted over. I've added a couple of photos. Any information you have about it would be greatly appreciated. Never heard of or seen one of these 25 factory custom 12 strings untill yours. Could be true or just a rumour. If a standard 6 string was converted the original holes would need to be filled and six aside added. That could or would explain the painted headstock. 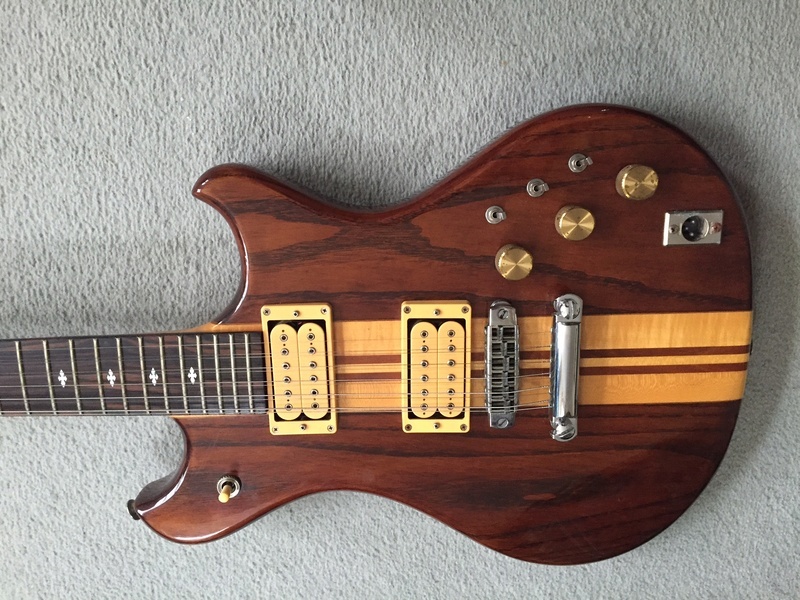 Folks do a lot of mods to guitars some strange! This looks like a decent one. 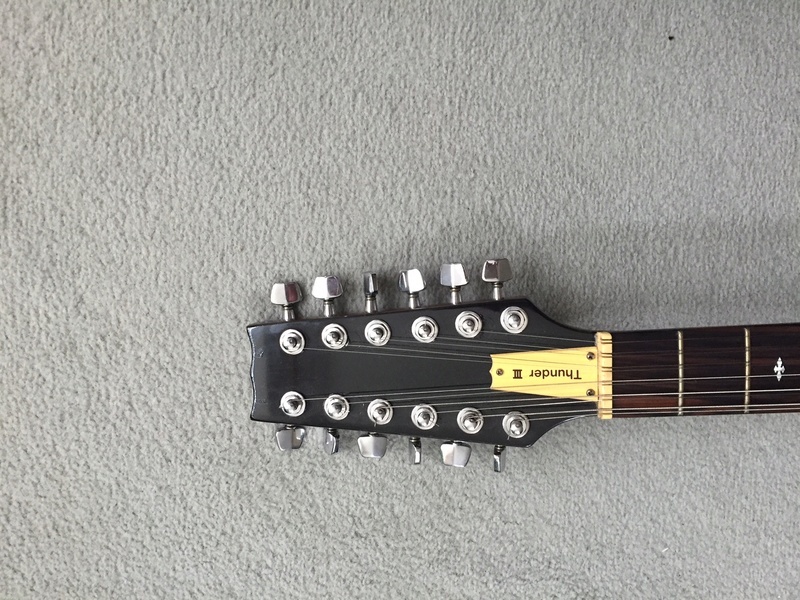 Also the machine heads seem to be loaded more to the outer edge of the headstock on the GBE side. Doubt it's a factory mod. This is a new one on me as well. It's rare to see an orignal Westone 12 string model (like, never? ), so when one pops up you tend to pay attention. I agree that this would seem to be an '81 build (version 1) and it looks to be legit to my eyes at least. 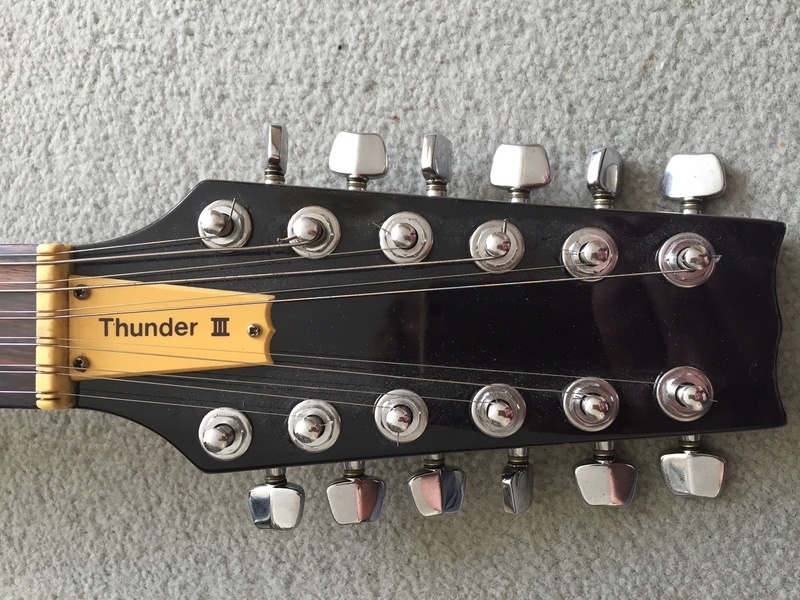 Interesting observation about the 6 string conversion the standard head stock on Thunder tends to be extra long so it is possible. But I think it was OEM rather than after market. I think the definitive proof may be in that bridge. How hard would it be to find one in the open market that would fit? 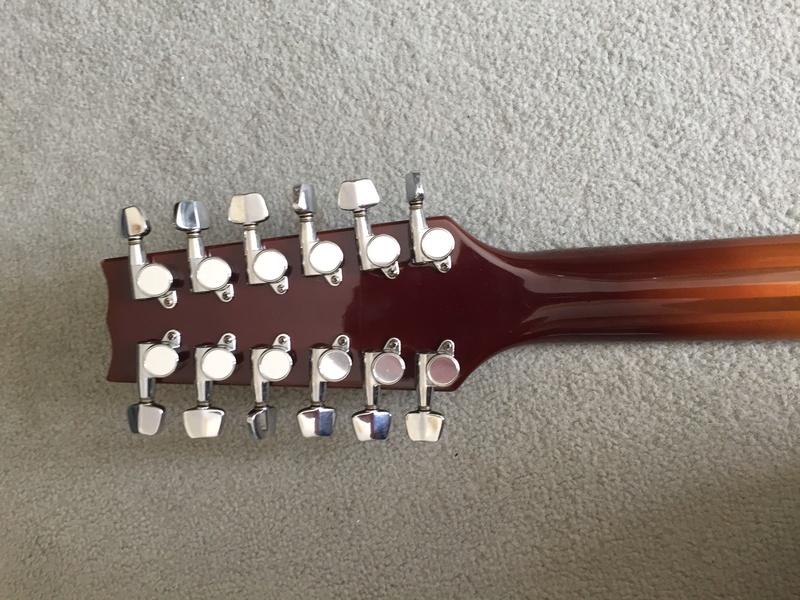 Members with a Mats made 12 string (Vantage, Aria Pro II) can probably tell if it's the same. The tailpiece on those are just standard size Barry. 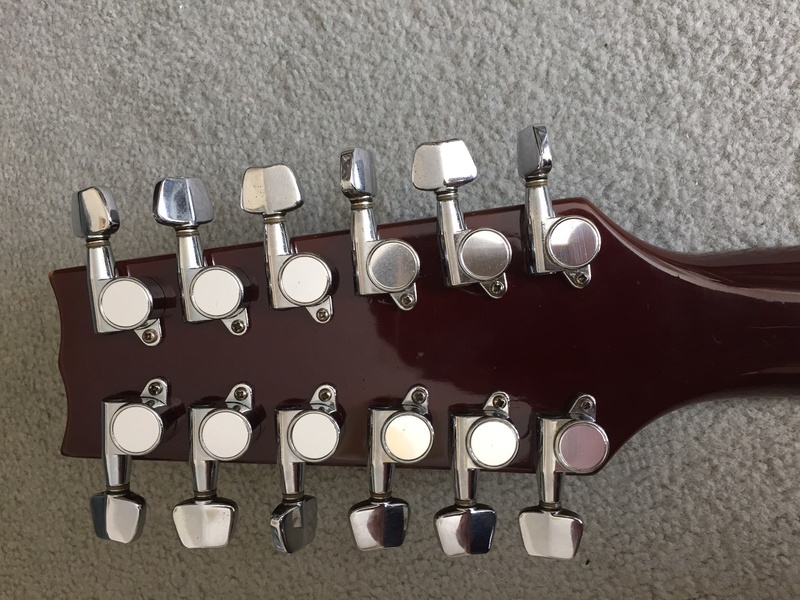 A 12 stringer tailpiece is widely avaiable. Even the Vantage 12's use a standard bridge with 2 extra grooves either side of the 6 stringer on a few I've seen. In that case Damian, back to those machine heads. I think we'll need a few more shots of the head stock Allang if you can please. The above shots are a bit off perpendicular so it isn't too clear if they are in fact installed equidistant from the edge on both sides as one would expect from Matsumoku. I'd also like to see some close ups in that area to try and determine if there actually was a break, or if the stain is hiding a modification as Westbone suggests. As I look again I'm seeing a couple of suspicious marks in the finish at the top of the head stock. Welcome here, Allang, and gee; you surely know how to grab a blokes attention, eh?! Nice guitar, bro!! 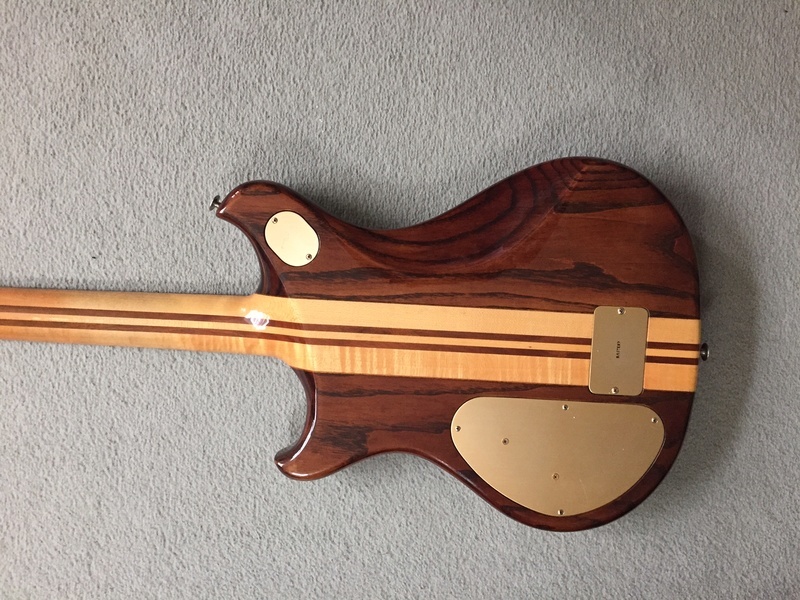 We know of no Westone 12 string apart from the Spectrums that were made for Trevor Rabin, and the 2 made by a former member of this board, so this is a little exciting!! I fear the lads may be correct that this is a post manufacturing modification but a bit more detective work and some photos of the headstock with an oblique lightsource may provide more clues. It looks lovely, doesn't it - the T-III would be my pick of the Thunders, and I hope it is, indeed, a genuine Matsumoku guitar! I have a Vantage VS-696-12 and access to a Vantage VA912, so I know just how good these electric 12s are!! Westbone wrote: Even the Vantage 12's use a standard bridge with 2 extra grooves either side of the 6 stringer on a few I've seen. Ever heard or played one? Nope... never ever even seen one! You wouldn't think that 3/4" would make that much difference, would you?! I do, however, like the way they look... and the T-III that I wanted was the version 3 with the S/H/S set up; I have the Electra X195 in that that configuration and love it to bits but those Thunders look to be a step up in construction values, eh! What pickups would this one have; 45s? So... 53s, like the active, neckthru Vantage and APIIs. That's what sh..... Nah too easy! Very odd that Westone never had a production 12 string. They did such a nice job on the Vantages and APII's. I prefer a G-scale guitar but I have a few F-scales which are very comfy too. Guess it depends on the overall design. Hi guys and thanks for all of the responses. As requested I've taken some more pics of the headstock, the upper machine heads all measure 9mm form the centre pin to the side of the frame and the lower ones are all 8mm from the side, looking carefully at the front there is evidence of the 6 original machine head holes. I would guess this would be an after market customisation. I also have a Thunder 11 in completely original condition and all working, serial No I100816, in great condition. Thanks for the additional pix Allang, but I am disappointed, on two counts. 2. That your only reason for posting was to get an evaluation in order to sell your guitar. When you registered, the sign up notice made it very clear that this is not what this forum is about yet you persisted. 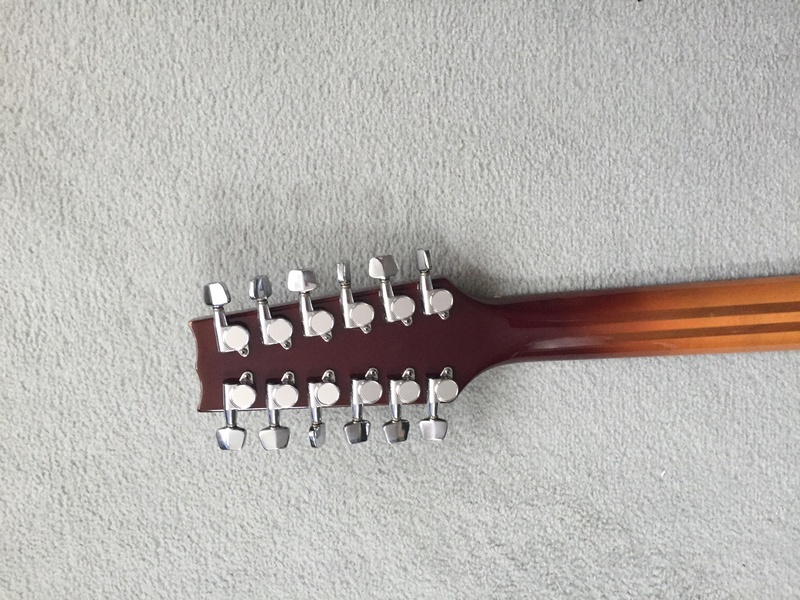 Moreover you introduced the post saying you were inquiring about the authenticity of the guitar, not its resale value. You've taken up a lot of people's time under what I consider to be a fraudulent pretext. And while this is a very nice mod and of general interest we are not arbiters of what Westones should sell for, much less a modded Westone. That's strictly up to the open market to determine. Oh, and well done Damian! Dang! All worked up for nuthin'. So how do you like it, have you played it much? I'd like to hear a review.